Well, my apologies for my lack of posts. Life has been hectic with 4-5 Dr.'s appointments a week. 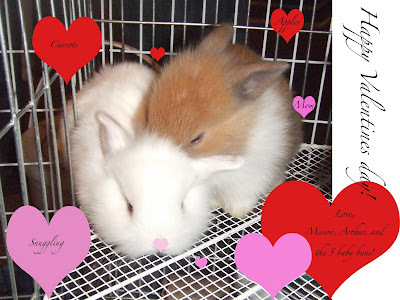 The bunnies are about 10 weeks old and we are in full swing of finding them homes. They are pretty big and eat through about 6 pounds of food a week! While trying to find the babies homes, my hubby & I have been looking for a house of our own (we rent currently) and we made an offer, which just got accepted yesterday! 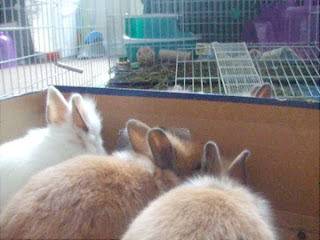 So new homes for all of us.. not just the bunnies! 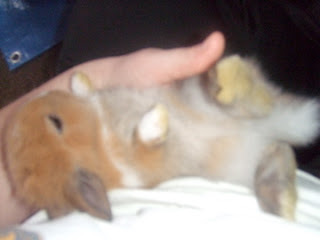 I can't seem to find all the bunny pics, so I'll put up some that I found that are more recent.. and I'll take a few more tomorrow! Sorry about the long time in between post... but I was in the hospital this past sunday through wednesday... turns out my neck pain and dizziness were strokes! 3 of them total, all in my cerebellum... I am home already, but I do have some balance issues. Unfortunately, I do not know when my next bunny post will be, but my husband says he's been taking pictures for me. I'll get back to the bunnies hopefully in a week or so. Thank for your support! but mom could use some time away from them! Not a whole lot new these past two day. Due to my neck pains I was not able to spend as much time as I would like with the baby buns - but I made sure to take pictures & clips! I will say I have a treat for you readers (well, at least I think so..) - I got a very good video of a little bunny tongue! It's very cute and sure to make you smile! I also have a very cute clip of one of them chewing... but mom decided to jump on me and I dropped the camera - it's still cute though. I hope you enjoy these little clips as much as I do! Well, today's post is more of question really, so maybe those of you out there who have raised baby bunnies can help answer my question. It seems that the babies have learned an 'adult' activity and now do this more frequently. I know nothing can happen right now, but it's a bad habit and it's a little embarrassing because they do this when people come over to visit. I assume this is natural, but I am surprised that they are learning this at such a young age! What can I do? Should I start to separate them already? They are still nursing. If anyone knows anything about this, please leave a comment! The babies just LOVE veggies! They get so excited when we bring them treats, and they all try to get around the bowl to eat... mom usually takes up most of the space though, so they have to bob their heads in, grab something and pull it further away. 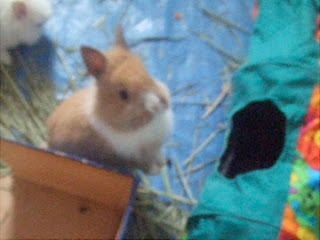 We had a gallon bag filled with carrots, celery, and broccoli - it only lasted like 4 days! Those little bunnies eat a lot! They certainly are healthy! We have also gone through about 10 pounds of food in the last 2 weeks since they have been eating solid food! I can see why bunnies are so lethal to gardens! What veggie carnage! 'Trouble' finding my camera to be tasty. It's a must see! Not a whole lot going on these two days. My neck was particularly painful and I just laid low by watching tv - Rick Steve's travels to Ireland, the news (because of the 15 inches of snow we got), American Idol auditions, and The Moment of Truth. The little buns were very understanding and hung out with me for awhile on the couch. It's amazing how creatures can take your mind off of the pain. My hubby was kind enough to keep rotating different bunnies for me throughout these two days. Despite all there was to explore down stairs where we were, the little buns were sweet and thoughtful enough to stay by me. Tell L.L. Bean to stop selling rabbit fur items! I'm a freelance graphic designer located in Milwaukee. I love animals & I do some graphic design work to help out local animal shelters. If you know of a shelter that could use some flyers or brochures made, just let me know!